Texas A&M begins its three-game home stand to close out the regular season with an 11 a.m. matchup Saturday against Ole Miss at Kyle Field on CBS. With a win, the Aggies' would be eligible for their 10th-consecutive bowl game, which is is tied for the 11th-longest active streak in the FBS (fourth-longest among SEC schools behind Georgia (22), LSU (18), Alabama (15). In a series that dates all the way back to 1911, Texas A&M leads Ole Miss, 7-3. The tightly-contested series has featured eight games that has been decided by seven points or less. Since joining the SEC in 2012, the series is split 3-3, as Texas A&M won the first two meetings in 2012 & 2013 and last season's contest in Oxford. The Aggies are looking for their first win at Kyle Field against Ole Miss since Sept. 13, 1975, in which No. 9 Texas A&M defeated the Rebels, 7-0. Texas A&M student-athletes are collecting monetary and canned good donations at Saturday's game for the AGGIES CAN Food Drive, benefitting the Brazos Valley Food Bank & The 12th Can. All fans that donate will receive a coupon for a FREE Whataburger. What started out as an idea to have a collection at one football game in 2000 has grown into the largest student-athlete volunteer run canned food drive in the nation. SERIES VS. OLE MISS: Texas A&M Leads, 7-3. Texas A&M Radio Network (Regional) - The Texas A&M Radio Network provides coverage via nearly 60 stations across the state of Texas. Texas A&M Spanish Network (Regional) - Texas A&M's Spanish broadcast can be heard on radio stations in Dallas, San Antonio, Houston, El Paso, Brownsville and McAllen, Texas. Locally, the TAMU Spanish Network can be heard on 1550 AM. SIRIUS XM: The Texas A&M Radio Network call of the game can be heard on SiriusXM at Sirius 133 / XM 207 / Internet 967. 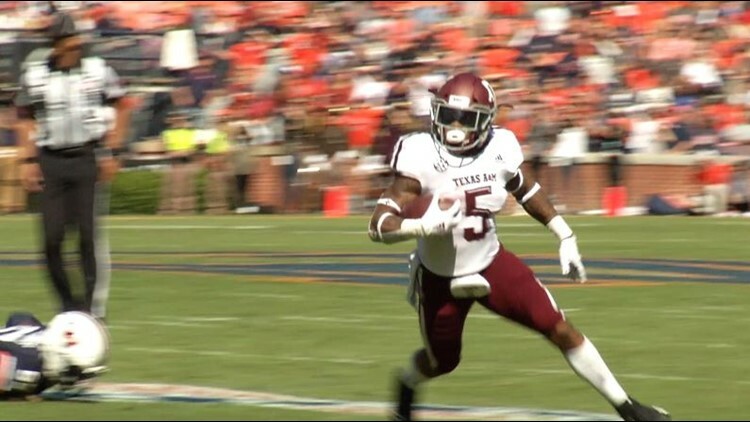 RB Trayveon Williams needs just 69 yards to reach the 1,000-yard milestone and would become the fifth Aggie in school history to record two 1,000-yard seasons in their career (Cyrus Gray, 2010 & 2011; Greg Hill, 1991 & 1992; Darren Lewis, 1988 & 1990; George Woodard, 1976 & 1977). Entering Saturday's game with 2,786 career rushing yards, Williams is 214 yards away from becoming sixth Aggie in school history to rush for 3,000 career yards. QB Kellen Mond is 373 yards shy of 4,000 career passing yards. Texas A&M's defense ranks first in the SEC and fifth in FBS in third-down conversions, holding opposing teams to just 28-of-102 (27.5%). The Aggie defense is holding opposing offenses to 81.4 rushing yards per game, which is the best in the SEC and second in FBS behind Michigan State (71.7). Texas A&M has dominated possession in the first eight games averaging 36:27 per game. The tally ranks first in the SEC and second in FBS behind Army, who is averaging 39:45 per game. Texas A&M has recorded 236 first downs this season, the most in the SEC and fifth in FBS, and is allowing just 132 first downs defensively, which tops the SEC and is third among P5 schools. The Aggies are just one of six schools nationally to rank in the top 30 in both total offense and total defense, joining Alabama, Clemson, Georgia, North Texas and Washington State. Through nine games, including four against current AP top 25 teams, Texas A&M is the SEC's leader in offensive and defensive first downs and time of possession. Texas A&M leads the SEC with 236 first downs, and is averaging 26.2 first downs a game, tops in the conference. Speaking to the balance of the Aggies' offense, Texas A&M is one of six FBS schools with 95+ first downs via rush (98) and 110+ first downs via pass (114). The Aggies are far-and-away the SEC leader in time of possession with an average of 36:27 per game, which is more than five minutes per game more than No. 2 Alabama (31:19), and ranks second nationally. Through nine games, including four against current AP top 25 teams, the Texas A&M defense has faced an average of just 53.9 plays per game, which is easily the lowest in the SEC. Among all P5 teams that have played nine games, Texas A&M's 485 defensive snaps is lowest in the nation by 37 snaps (522 by Michigan). Additionally, Texas A&M has limited opponents to just a 27.5 percent success rate in third down situations (No. 1 in SEC/ No. 5 in FBS) and has allowed only 28 third-down conversions in nine games (3.1 per game), which ranks No. 1 among P5 teams. Texas A&M is allowing just 14.9 first downs per game, which leads the SEC and is fourth nationally. The 53.9 plays faced per game in 2018 is an enormous turnaround from last season when the Aggies faced an average of 72.5 plays per contest. A 53.9 average for a 13-game season in 2018 would mean the Aggies would face 242 fewer plays than in 2017 (or the equivalent of nearly four 61-play games).